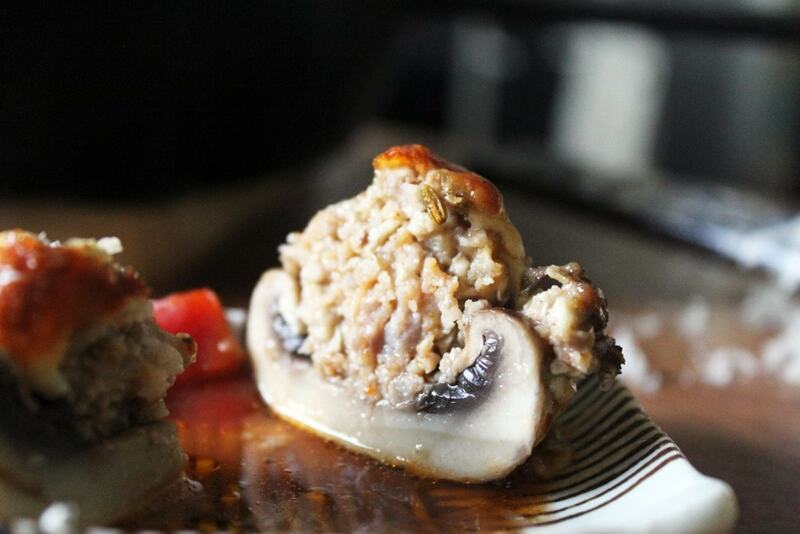 You need big mushrooms for stuffing. 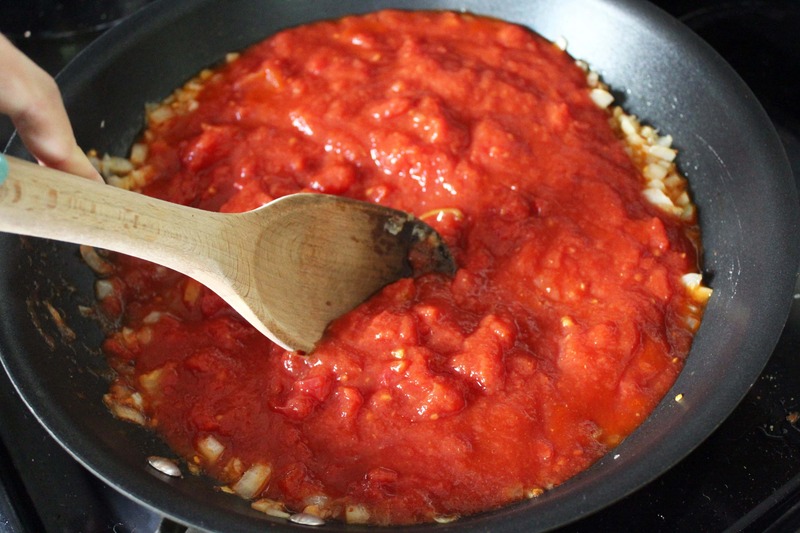 For the marinara you’ll need olive oil, onion, garlic, crushed red pepper, crushed tomatoes, and honey. For the filling you’ll need sausage, parmesan, and garlic. 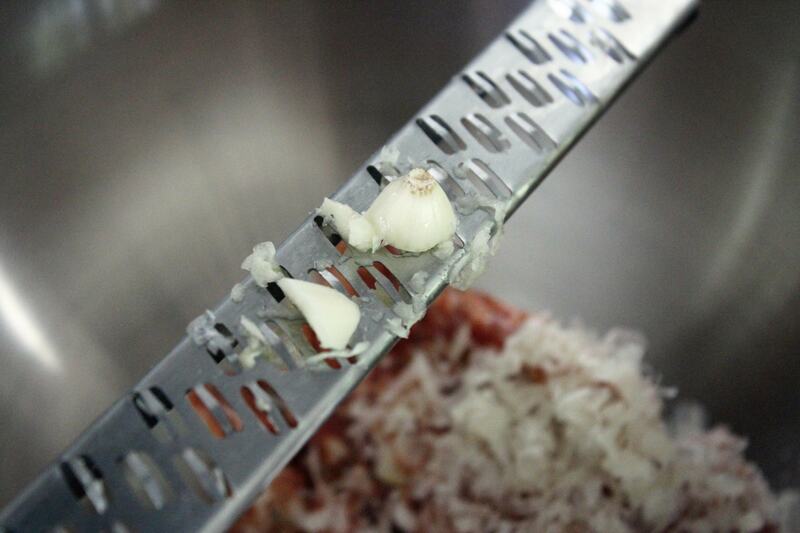 Then we top the whole thing with some kind of melty lovely grated cheese. Any kind of white cheese you like! This was monterrey jack and was perfect. 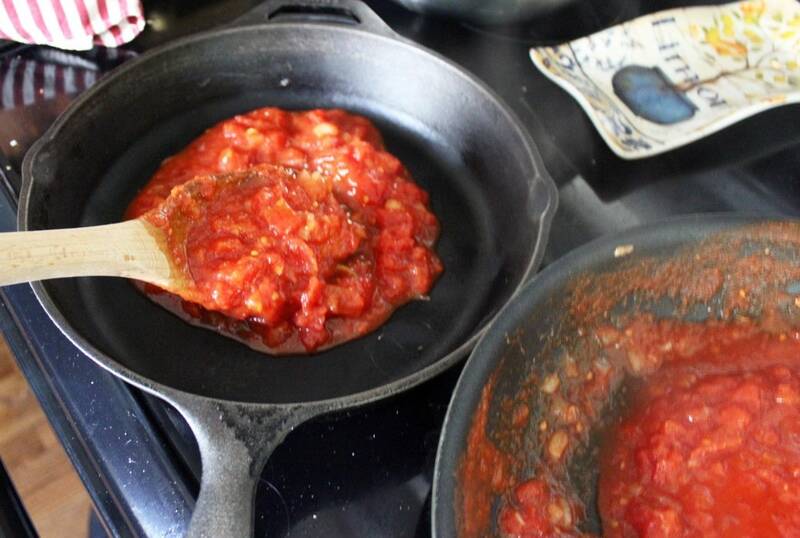 First, we’ll make the marinara like we make any other marinara in our lives. 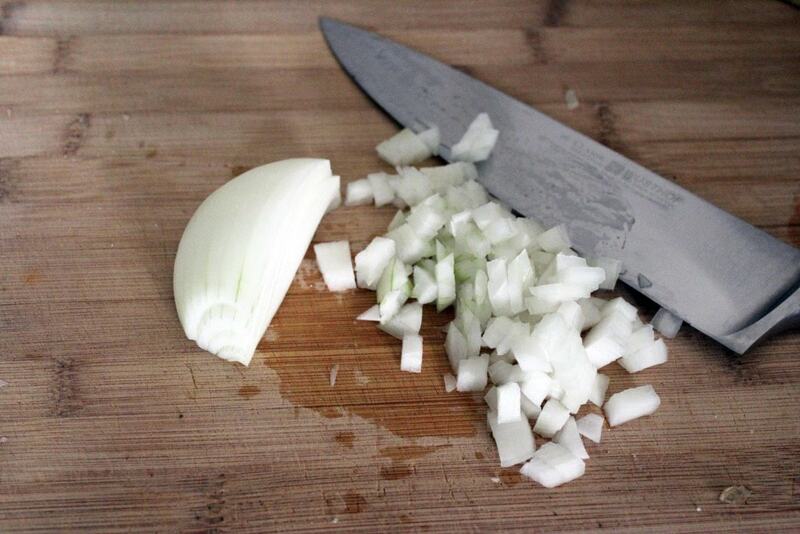 Chop the onion first! Add the onion, olive oil, crushed red pepper, and a sprinkle of salt to a skillet over medium heat. 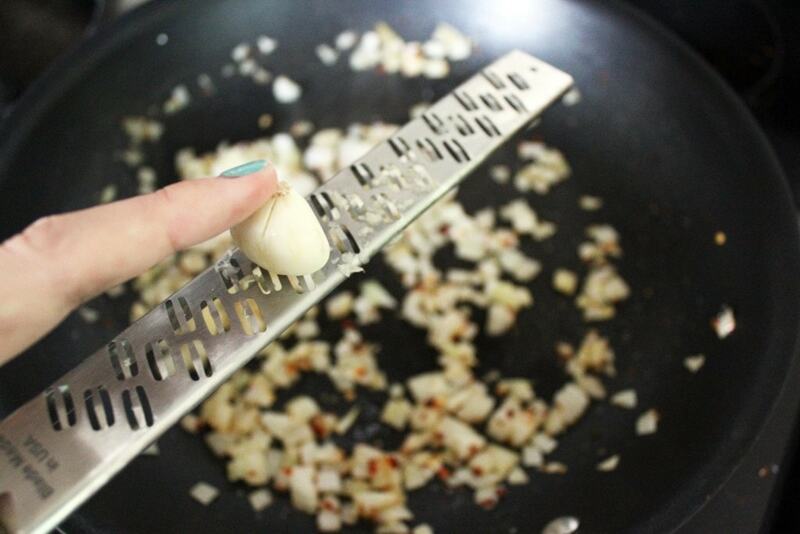 Let the onions cook and soften for about 2 minutes, then grate in the garlic. You can chop the garlic too, of course, I just used the grater on this particular day for the garlic in the sauce AND the mushrooms and to grate the cheese. 1 tool, multiple applications. Boom. Let the garlic cook with the onion mixture for about a minute, then add the tomatoes and the honey. Stir the sauce together and taste it and add as much salt as you’d like. Now, we might not use all the sauce, but go ahead and spread a bit of it in the bottom of a dish that you’ll use to bake the mushrooms. 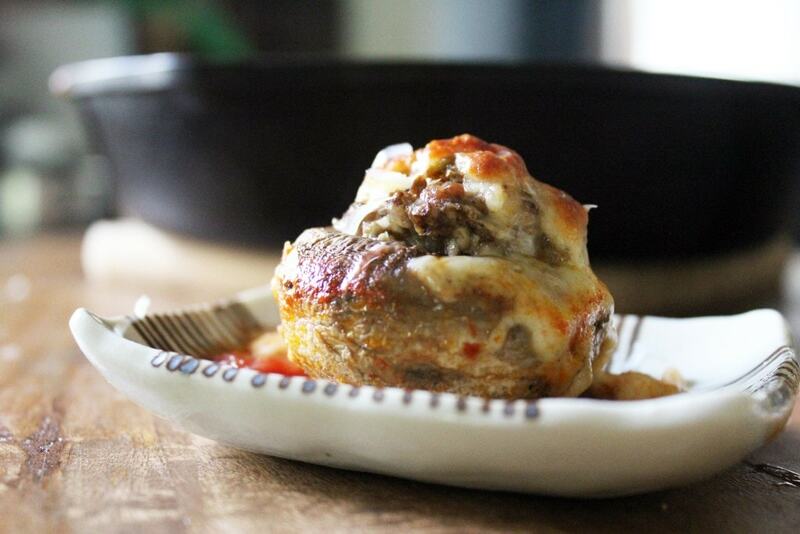 You’ll need a dish that can hold all the mushrooms edge to edge (they’ll cook down a bit in the oven). I used a 10-inch cast iron skillet and it worked great. 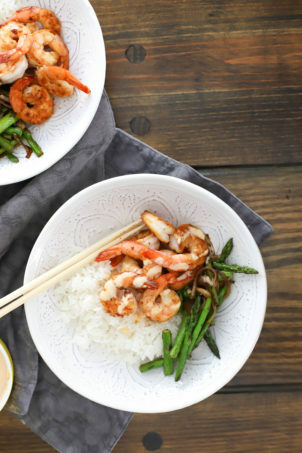 Set the rest of the marinara aside for another use. Now, onto the mushrooms! Take the stems out of the caps and put them in a food processor. Grind the mushrooms up – we use about half mushroom half sausage for this recipe, which keeps the filling slightly lighter AND means that we don’t spend quite as much money on sausage. Boom. 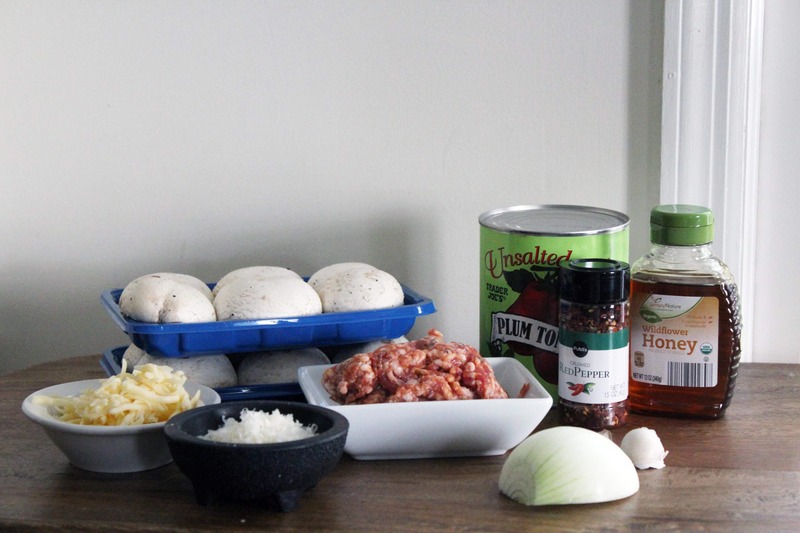 Now, add the ground mushrooms, parmesan, and sausage to a bowl. Grate another clove of garlic into this mixture. 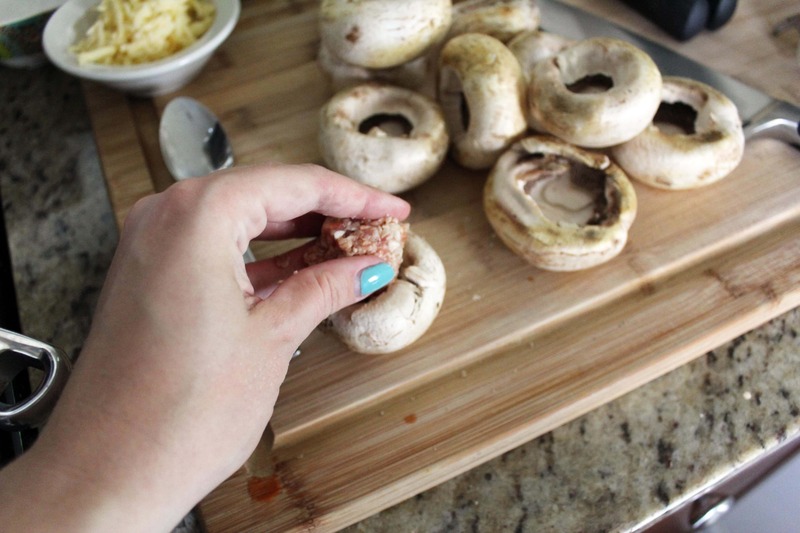 Use your fingers or a spoon to mix the sausage with the other ingredients, then we’re ready to stuff mushrooms! Make little balls of the filling and press them into the mushrooms. 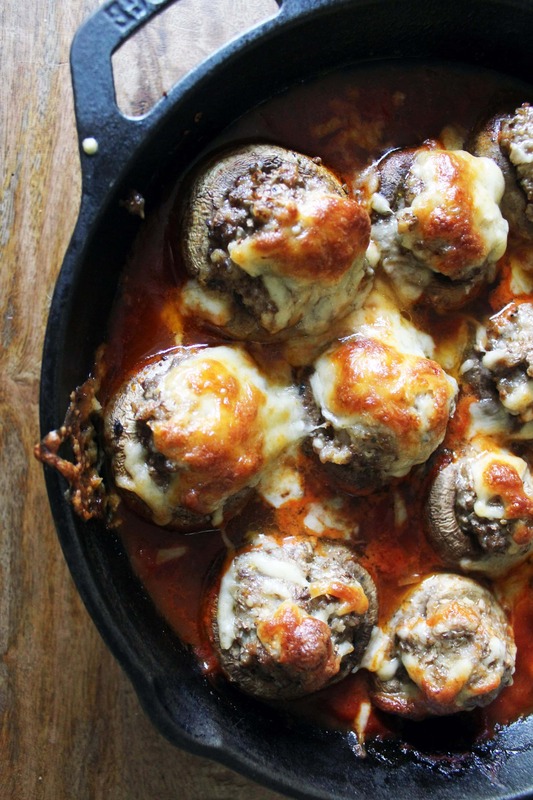 We want to use all of the filling and it’ll heap up over most of the mushrooms. 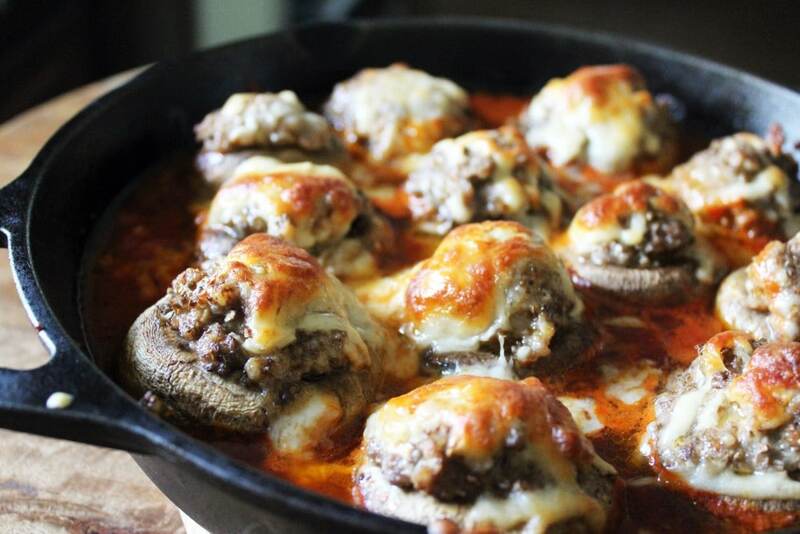 Nestle each of the mushrooms in the sauce that you prepped in the dish, and then sprinkle the whole mess with cheese. LIKE THIS. The marinara should come halfway up the mushrooms, maybe a bit less. We don’t want too much sauce in the dish because the mushrooms will release a lot of water as they cook and we don’t want to end up with too much sauce. Now, we bake! Or we stick this in the fridge for a few days until you’d like to eat them, whatevs. 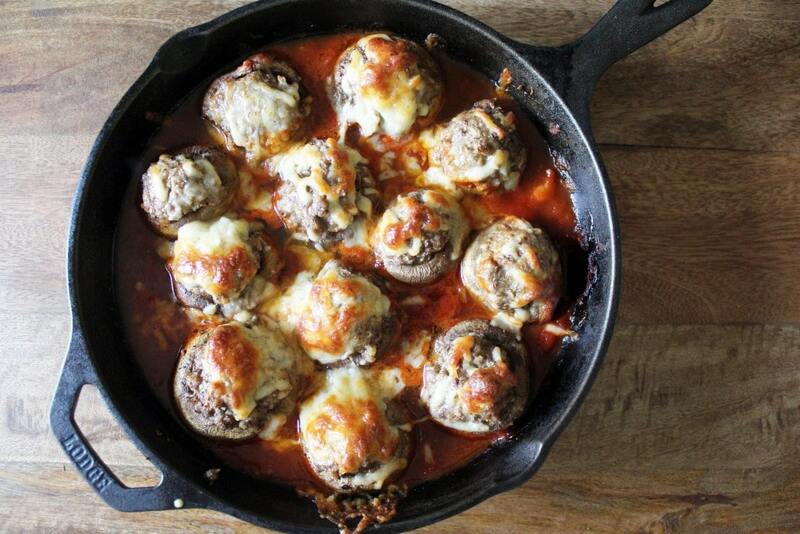 When you’d like to bake these, do so at 375F for 30-45 minutes until the cheese is melted and the mushrooms are soft. 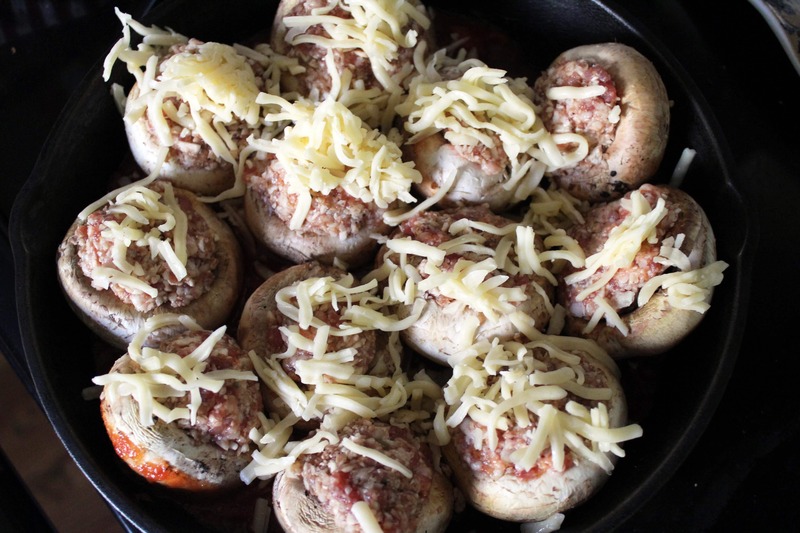 Depending on your oven, the cheese might brown or even burn before the mushrooms are cooked through. Just check the mushrooms after about 20 minutes and, if that starts to happen, place a piece of foil really loosely over the pan to keep cooking the mushrooms without browning the cheese more. And there you have it, my friends. 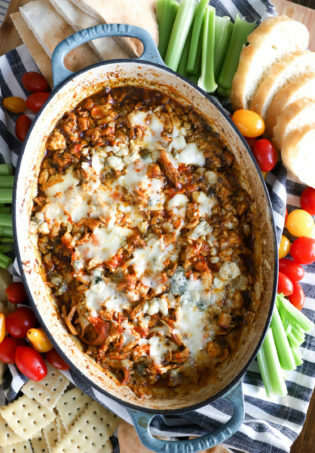 A great appetizer or addition to a potluck kind of thing. These were DEVOURED, and may have very well been the reason that Jay is no longer a strict vegetarian. Because pork, y’all. 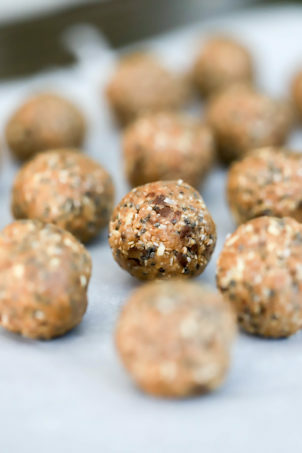 Make them soon! Eat them all! Enjoy every bite. Preheat the oven to 375F and a large skillet to medium heat. Make the marinara. To the skillet, add the olive oil, onion, crushed red pepper, and a sprinkle of salt. Cook for 2 minutes to soften the onion, then add the garlic. Cook for 2 minutes more and add the tomatoes and honey. Let the sauce come to a simmer, then taste and add salt to your preference. Turn the heat off. In an oven proof skillet or dish large enough for all of the mushrooms (I used a 10-inch round skillet), spread about half of the marinara sauce. Stuff the mushrooms. 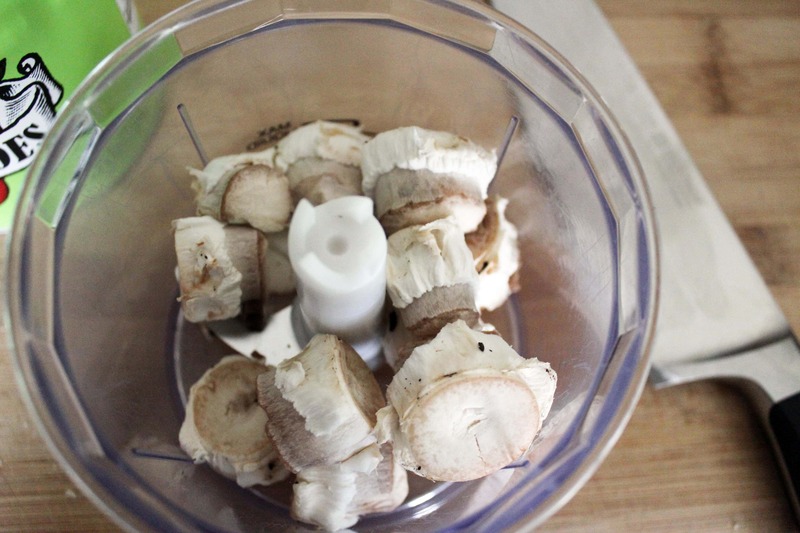 In a food processor, blend the mushroom stems until finely chopped. 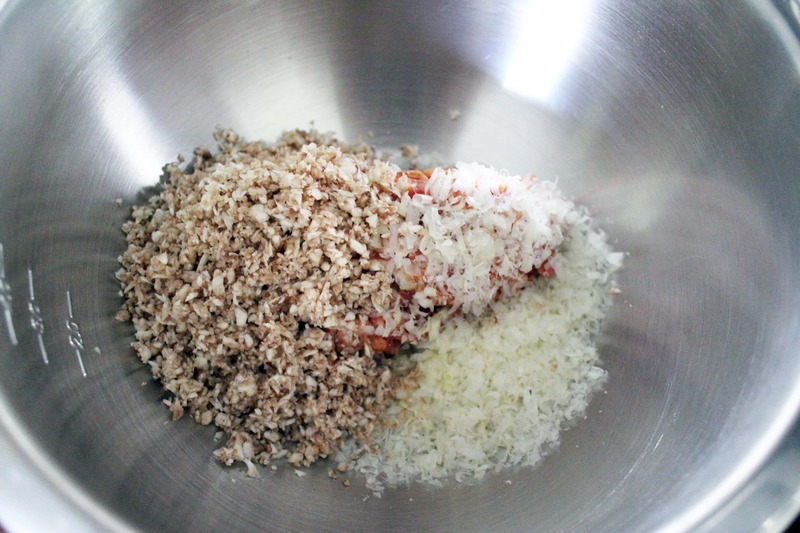 Add the mushroom stems, sausage, parmesan, and the 2nd clove of garlic to a bowl. 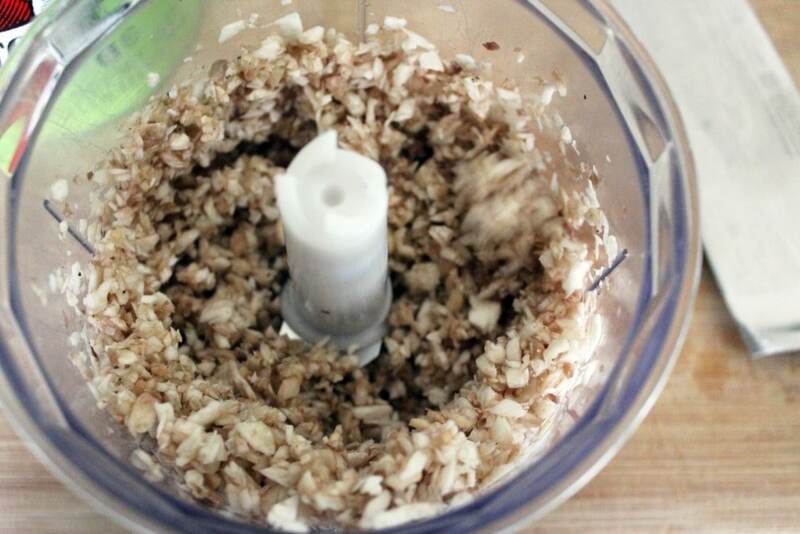 Mix together, then form in to mounds and heap in the mushrooms. 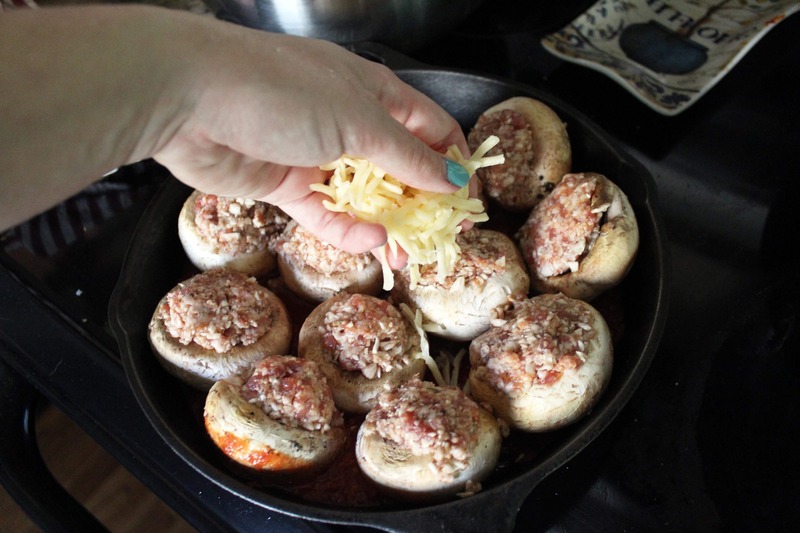 Nestle the stuffed mushrooms (we want the filling to heap over the mushrooms) in the marinara sauce and sprinkle the entire dish with the grated cheese. 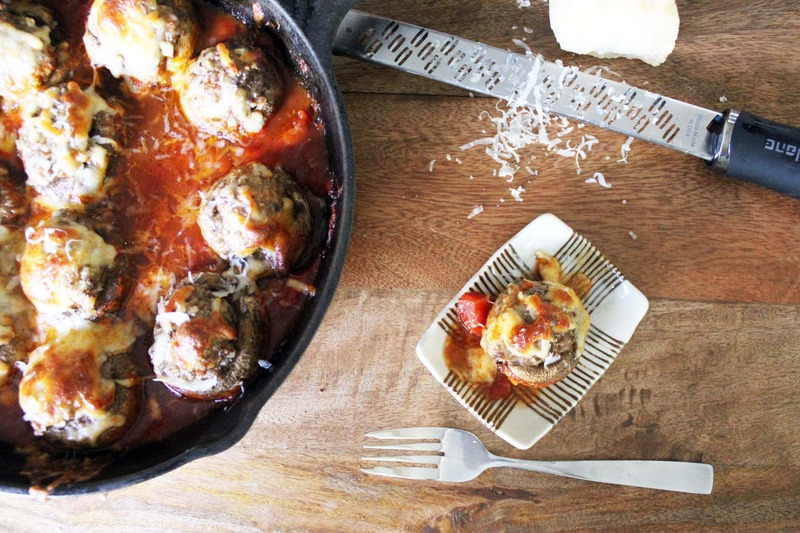 The marinara should come about halfway up the mushrooms, but no more. If it doesn't, add a little bit more. Reserve any leftover marinara for another use. Bake the mushrooms at 375F uncovered for 30 minutes until the mushrooms are tender and the cheese is browned and bubbly. If the cheese browns before the mushrooms are cooked, tent with foil and continue cooking for 10 more minutes. 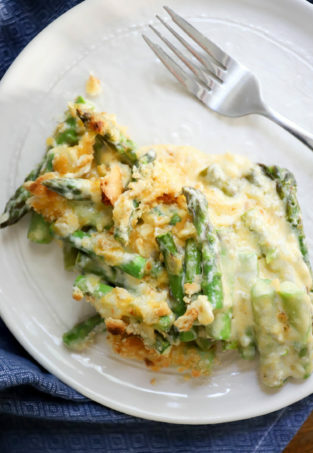 Serve as an appetizer or with bread or pasta as an entree. Enjoy!